To understand how fearful investors are of all the wild cards in the U.S. presidential election, just take a look at the gold market. Anxiety has gripped the financial markets with opinion polls signaling a tightening race between Democrat Hillary Clinton and Republican Donald Trump, who showed signs of strength with early votes cast in Iowa and Ohio. Last week, wary investors pushed the S&P 500 Index of equities to its longest slump since 1980, fleeing to assets such as gold that are deemed less risky. Bullion futures in New York have risen for four straight weeks. The gold net-long position jumped 14 percent to 172,532 futures and options contracts in the week ended Nov. 1, according to Commodity Futures Trading Commission data released three days later. It was the biggest gain since Sept. 27. On the Comex in New York, gold futures climbed 2.2 percent to $1,304.50 an ounce last week. Prices fell 1.8 percent on Monday after the FBI decided to stick by its finding that Hillary Clinton didn’t commit a crime in her handling of e-mails as secretary of state. A Trump victory represents “significant policy uncertainty,” Citigroup Inc. analysts including Edward Morse and Nell Agate said in a Nov. 3 report. That could push gold to $1,400 in a “knee-jerk reaction,” the bank said. While a Clinton win could send prices down to $1,250 in the short term, her administration, coupled with a Democratic sweep in the House and the Senate, would allow for “sharp fiscal expansion, boosting U.S. inflation prospects,” and helping support bullion in the medium term, the analysts said. A victory for either side could spell turmoil. Both campaigns have amassed lawyers and could challenge a defeat, while supporters from the losing camp could stage political protests. 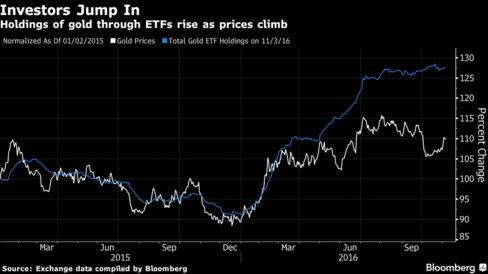 The increasing risk of tumult has driven investors to exchange-traded funds backed by bullion. SPDR Gold Shares, the biggest such fund, attracted $309.1 million of inflows in the week through Friday. Holdings in global ETFs climbed to within 0.8 percent of a three-year high reached in October, data compiled by Bloomberg show. Retail investors are also adding to holdings. Gold-coin sales gained for a third month in October, the longest streak in almost six years, data from the U.S. Mint show. The election fears overshadowed comments last week from the Federal Reserve that signaled policy makers could start raising U.S. interest rates soon. The odds of a rate increase in December rose to 82 percent Monday from 71 percent a week earlier, futures trading showed. Higher rates curb the appeal of non-interest bearing gold. Gains for the U.S. labor market could also cap gold’s rally as the economy picks up steam. The monthly jobs report published Friday showed payrolls rose at a steady pace and the broadest rate of unemployment fell to an eight-year low. Still, traders should brace for the unexpected, Morganlander of Stifel said. The CBOE Volatility Index, the measure of market turbulence known as the VIX, climbed for a ninth day Friday, the longest streak since the data starts in 1990. 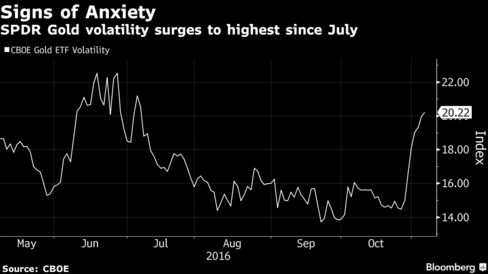 The CBOE Gold ETF Volatility Index, which measures swings for bullion, reached the highest since July. “Investors should put their seat belts on because there will be a tremendous amount of volatility, regardless of who gets elected,” Morganlander said.